The Winter … requires strong preparation. So I ‘equip’ the pharmacy of your home with products from the pharmacy of nature. The Power Health is more than ready to provide you with the necessary to prevent but also to face the upcoming winter … and not only. In a beautiful event held on Friday August 22 at the company became the official presentation of the new products. The Research & Development presented analytical formulations of new products and marketing department focused on recommendations and actions to promote them above and below the line. Power Health extends the range of the successful Power Foods with two more dynamotrofes, the Artichoke, health and protection of the liver, and cod liver oil, which together with rhodium, Buckthorn, the Mastic, Royal Jelly and cranberry , made ​​the … 7 ‘wonders’ of nature. In the course of development … and the series Classics Platinum Range enriched with the Memo + for memory and concentration and advanced … Vitamin Ester-C® 500mg. The high nutritional value and quality nutritional supplements that are longer the platinum option for Greek family. The large family of effervescent has won consumers grows with two more members revolutionizing … taste with two unique compositions, the Fe + C, iron and vitamin C and Ca + D3 calcium and vitamin D3. Two effervescent to win 1st place on your selection. Regarding the duo’s discomfort, cough-cold, Power Health has created two extremely syrups with pure honey and medicinal herbs, Herbomel Adults for adults and for children Hermobel Kids. The winter of nature contains pharmacy and Vita C Caramels with juicy tangerine flavor that will always bring you back and giving you energy whenever you need it. Relief from negative emotions caused by everyday stress and offer authentic lozenges Bach Rescue Pastilles based on flower essences created by Dr. E.. Bach. 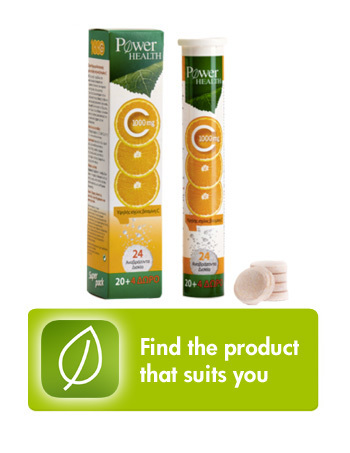 The Power Health has natural and effective solutions to prevent or deal with a family … flu, viruses and colds. Equip the pharmacy of your home with the gifts of nature and always with the quality of the Power Health.